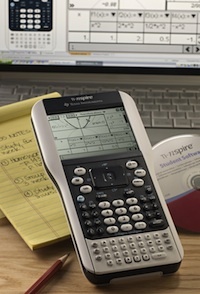 Texas Instruments has introduced two updates to its high-end TI-Nspire line of graphing calculators, the new TI-Nspire with Touchpad and TI-Nspire CAS with Touchpad. The updated models sport a new touchpad positioned just beneath the display, one that allows trackpad-like input along with clickpad-like directional and center clicking. It also adds an alpha keyboard positioned at the bottom of the faceplate, designed for easier text entry. With the new TI-Nspire Software and TI-Nspire CAS Software, now in version 2.0, the Nspire handhelds also gain an enhanced home feature with easier access to files and tools. It also adds a "scratchpad" feature that allows users to "perform quick calculations and create graphs without opening a new file." The TI-Nspire models with touchpads are, like other TI-Nspire models, compatible with Texas Instruments' wireless student response/classroom polling system, TI-Nspire Navigator, as well as with TI-Nspire software editions for teachers and students. The TI-Nspire with Touchpad is available now through TI's online store for $149. TI-Nspire CAS with Touchpad is also available, selling for $159. (The CAS version, "computer algebra system," allows users to see algebraic representation of their problems.) Retail versions of the new systems will ship "in time for the 2010 back- to-school season," according to TI. The retail versions will include licenses for home use of the TI-Nspire software for students. Users of the TI-Nspire with Clickpad can upgrade their hardware to the Touchpad version for $10. The software update is available free.